Nelson Piquet Junior is hoping for a more positive 2010 when he moves to the United States. 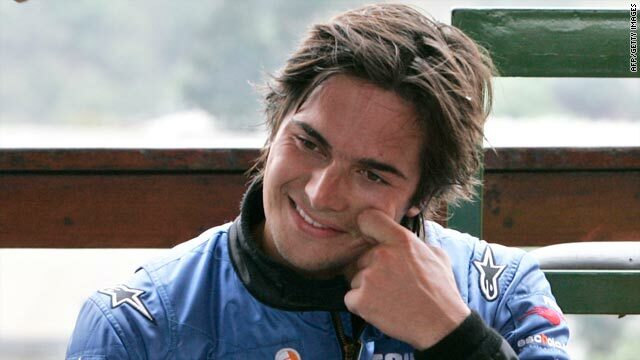 Piquet gave evidence against former team boss Flavio Briatore about Singapore "crashgate"
(CNN) -- Nelson Piquet Junior has confirmed that he will leave Formula One following his controversial 2009 season with Renault, and will switch to the American NASCAR series. The Brazilian was sacked by Renault in August after failing to score a point, and then gave evidence against the French team which saw boss Flavio Briatore banned for ordering the driver to deliberately crash at the 2008 Singapore Grand Prix. While Briatore's ban was lifted by a French court, a ruling which is being appealed by motorsport's governing body the FIA, Piquet has been left on the outer and unwanted by the other teams. The 24-year-old, son of three-time F1 world champion Nelson Piquet, has decided to switch to stock car racing in the United States, but has yet to reveal his new team. "I have spent the last few months carefully evaluating my options for this year. I had to choose a path and it was a difficult decision to make," he told his official Web site. "Being successful in Formula One was always my goal but I have learnt that happiness is just as important as ambition, and after my first 18 months in F1 did not go as planned I have decided to focus on something different and have chosen to take a route in America. "NASCAR is hugely challenging and nobody has ever come in as an outsider before and gone on to win it -- it will be the ultimate challenge. This will be an awesome new challenge for me, and a healthy one. "I have found a good group of people that are really willing to help me in my career and I am grateful that they are there for me. I think it will be a positive environment and a good life experience. I am sure this year is going to be fantastic and I am very excited at the prospect of my future. "I am sure I will still do some racing in Europe as I have a lot of ambitions in my life, one of which has always been to win the Le Mans 24 Hours." Meanwhile, seven-time F1 world champion Michael Schumacher has begun preparations for his comeback with Ross Brawn's new Mercedes team by testing a GP2 series car in Jerez, Spain. The 41-year-old, who is helping to develop the team's 2011 GP2 feeder series car, was encouraged by the outing despite being restricted by wet weather. "It was good especially because after a long time I could drive again in a car that came almost close to a current Formula One," he told his official Web site. "Despite the weather not being what we all would have liked all my senses were nevertheless on full alert -- this alone was worth it. Unfortunately it was always just too wet to go out with slicks. I tried them twice but had to go back to the box immediately. "But still I gain a lot from being here because even if you cannot reach F1-level in terms of G-forces, you are still able to practice the communication with the engineers and the sensibility on the limit. "Fortunately it was back very soon. I felt comfortable out on the track from the very beginning."